[12a After the earthquake came a fire, but the Lord was not in the fire.] 12b And after the fire came a gentle whisper. 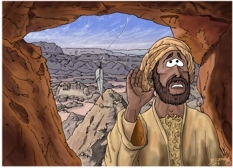 13 When Elijah heard it, he pulled his cloak over his face and went out and stood at the mouth of the cave. The sun is to the left (unseen), casting shadows to the right. 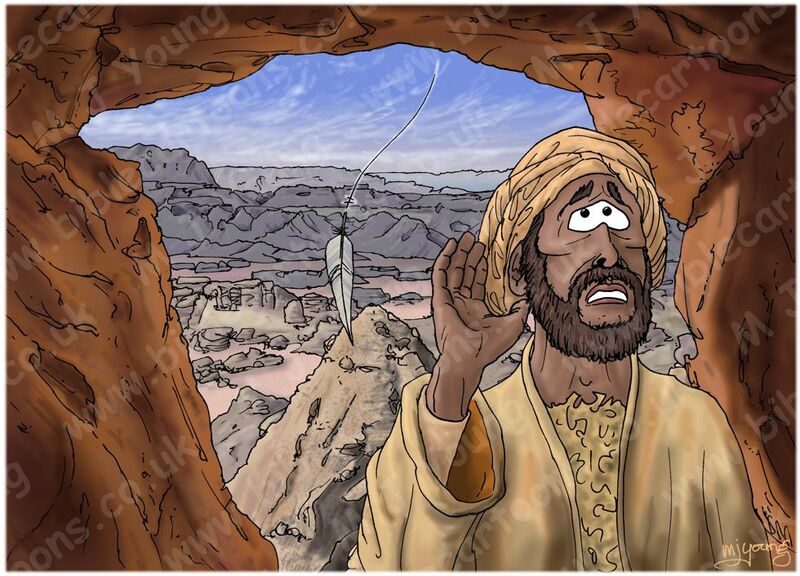 In this scene I have represented the Lord God’s “gentle whisper” with a bird’s feather, falling behind Elijah, as he stands with his back to the cave entrance. In the next moment Elijah would “pull his cloak over his face and went out and stood at the mouth of the cave”. I have used the same cave and background rocks from a previous scene (1 Kings 19 – Elijah flees to Horeb – Scene 05 – Into a cave), but have altered the clouds, and modified the rock colours, which represents some time passing between that scene and this one.